Back Yard Bird Shop is a Friend! Don’t forget to sign up to volunteer for Planting Day at the NatureSpace on Saturday, November 10! Also, we’ll be celebrating the completed NatureSpace at our November 14 meeting, so be sure to put that on your calendar. Anyone who is interested in making improvements to the dog park or fundraising for the children’s play area should also attend this meeting. 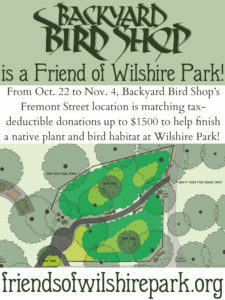 Author Friends of Wilshire ParkPosted on October 22, 2018 Categories AnnouncementsTags business partners, community, donations, fundraising, NatureSpaceLeave a comment on Back Yard Bird Shop is a Friend!